Something about my eyes didn’t seem quite right. That’s not unusual. I’ve worn glasses for near-sightedness since I was in sixth grade. 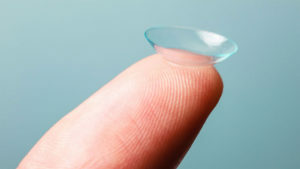 I got “hard” contact lenses—the kind that scratch easily and cost a fortune to replace—when I was in high school. Later, I moved to disposable lenses, which look and handle like tiny pieces of round cellophane and are thrown away twice a month and replaced with a fresh pair. Now that I’m a senior citizen, correcting my vision has grown even more complicated. I wear “mono-vision” contacts, with a low-strength lens in my right eye (aka my reading eye) and a high-strength lens in my left (my driving eye). Yeah, but. Sometimes I struggle to decipher road signs, especially at night. If I have my contacts in and need to read small print, I have to put on reading glasses, too. And if I have a lot of close-up work to do, it’s best to take my contacts out and go at it bare-eyed. All of which is backstory to what happened earlier this month. It was the week that two other Putnam County Election Commission employees and I traveled to nursing homes and assisted living facilities to help the residents vote. I’m in charge of reading the ballot to anyone who needs assistance. The words on the ballot are typed in an extra-large font. So far, I’d been able to read it without glasses. On this particular day, however, I couldn’t. I put my readers on but the words still weren’t as clear as I would have liked. I thought back to when I’d popped my contacts in earlier that morning. I scooped the right one out of its case and positioned it on my index finger, only to notice it was torn. Rats and double rats! The contact was only a couple of days old and I hated to throw it away, but you can’t wear a contact with a tear in it. I took a fresh one out of the box marked “R” and popped it into my eye. Then something—a text or a phone call or the dog barking or who knows what else– interrupted me. I returned to the bathroom, finished with my eyes and dashed off to work. All day long, my right eye itched. It felt dry. And I definitely couldn’t see well. I could hardly wait to get home and fix whatever was wrong. As I stood in front of the mirror and pinched the right contact between my thumb and index finger, it felt like I was pulling a big glob of plastic out of my eye. I soon saw why. I’d been wearing two contacts in that eye. Luckily, I’d put only one in my left eye, which would explain why I could see to drive. Good grief. Next thing you know, I’ll be going to town with my clothes on inside-out.